In 1897, the year Richard Brevard Russell, Jr. was born, the world was poised for a dramatic swing into a century that would see more changes in religion, politics, society, science, technology, and war than almost all other centuries of human history combined. It was a wild ride for a boy born to fulfill great expectations in the mercurial modern political arena yet reared to venerate the worn and vanishing splendor of the American South. He would become one of the half dozen most powerful men in Washington for a period of almost twenty years, and it would be frequently admitted, most notably by President Harry Truman, that if Russell had not been from Georgia, if he had been from a state such as Indiana, Illinois, or Missouri, the presidency could not have been denied him. His love of the South and his native state was such that when Truman’s remark was quoted to him, Russell replied: “I’d rather be from Georgia than be President.” This book acquaints the reader with a fascinating and complex man of contrasts. An ardent segregationist who fought civil rights legislation, Richard B. Russell was also the devoted father of the School Lunch Program. A Georgia farm boy, Russell almost idolized the agricultural society from which America sprang but embraced the nuclear age and space technology. An intense family man, he appreciated women, fell in love easily, and conducted numerous affairs. Yet Russell never married. Deeply private, he lived his entire adult life in the public eye. Richard Russell was good company. His personal story makes good reading. While there is no shortage of scholarship on this most prominent and enduring of Georgia's 20th century statesmen, this intimate and engaging portrait by Sally Russell, who knew him as both uncle and next door neighbor, is a most welcome addition. She offers fresh perspectives not only on the man and his family, but also on his relationships in Washington, and the considerable influence he wielded in Congress and with presidents from FDR to Richard Nixon. 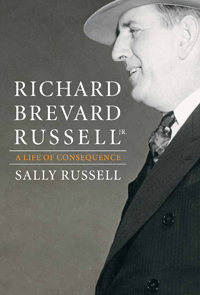 In tracing the career of an uncle she much admired, Miss Russell also reveals much about the multiple political eras on which he left his mark. This excellent biography of one of America's greatest United States Senators is further evidence of Sally Russell's talents as an accomplished author. It is must reading for anyone who wishes to understand Richard Russell the Senator or Richard Russell the man. The Russell in these pages is the one I knew in the last five years of his life as a member of his staff, the finest of public servants and a magnificent human being."